A large, extremely sturdy President standard dock on a private shore, which comes standard with stylish side cladding. Accessories for the dock are mooring rings and Toppi Fender bumpers. President Demand dock at a privately owned shore in Kotka, which has a total of three large President dock elements. Accessories for the dock include an SL-140 swimming ladder, railing, bollards and light posts. Swimming facility ordered by the City of Nokia, built using dock elements from the MyPort24 collection. The diving platform at the end of the dock has two levels, one metre and three-metres high, as well as an SL-140 swimming ladder. This swimming beach in Kennonnokka is on the shore of the Vihnusjärvi lake near the Nokia summer theatre. The dock at the swimming beach in the village of Luopioinen (Rajalantie 25, 36760 Luopioinen), was ordered by the City of Pälkäne. The swimming dock is made of Low-Susanna dock elements. The dock has an SL-140 swimming ladder as an accessory. MyLife swimming facility in Lammi (now Hämeenlinna), which was built using High-Susanna docks. The dock has an SL-140 swimming ladder as an accessory. Private cottage dock on the shore of Iso-Humppijärvi in Hämeenkyrö. The dock is composed of two Little-Susanna dock elements and a walking bridge. Low-Susanna privately owned dock in Ellivuori in Sastamala. The walking bridge is attached to the dock with joints. The dock has benches, mooring rings and a Susanna swimming ladder as accessories. MyLife swimming facility in Teisko in Tampere, built using Harbour dock elements. The swimming dock has SL-140 ladders as accessories. Large Harbour dock with a steel ramp at the Kabböle service marina in Loviisa. The dock's accessories include cross bollards, bumpers and a safety step. MyPort cottage dock on a privately owned shore in Vesilahti. MyPort collection docks are well-suited for mooring boats and are also used as marina docks. Low-Susanna docks are well-suited as canoeing docks because of their low deck height. The dock in the photo is in Tampere. This large swimming facility in the City of Keuruu was built using docks from the MyPort collection. The dock has a diving platform as well as railings, benches and a number of SL-140 swimming ladders. Harbour Standard boat dock at the Pakkahuone guest marina in Uusikaupunki. Laituri voidaan rakentaa juuri sellaiseksi kuin Sinä haluat. Sastamalassa, yksityishenkilön rannassa, oleva erikoismuotoiltu laituri palvelee sekä uinti-, oleskelu- että veneilykäytössä. Floating bridge connecting Kelanranta to Kirkkosaari in Kuusamojärvi, Kuusamo, built with Harbour+ dock elements. Harbour+ collection docks are made of large elements with edge load-bearing capacity optimised by pontoon placement. The dock's deck was built using sturdy planks, which allow it to be used by light vehicle traffic, as well. Low-Susanna dock on a privately owned shore in Nokia. The large dock has plenty of room for lounging. Low-Susanna docks are well-suited as swimming docks because of their deck height. High-Susanna is a stable, attractive dock that is well-suited as a swimming dock and for mooring a boat. The dock in the photo is on a privately owned shore in Salo. High-Susanna docks can also be equipped with side cladding as an accessory.
. The Japi dock package includes a dock element and a ramp. The Japi dock is best suited for sheltered shores. The dock in the photo is on a cottage shore in Ritajärvi, in a nature conservation area in Karkun Hornio in Sastamala. MyPort Xtra marina in Kuopio. MyPort docks are a technically high-quality collection, but construction is cost-effective. The MyPort Standard dock is designed primarily as a marina dock for small boats in sheltered conditions. The dock in the photo is located in Kokkola. Basic-Susanna is a basic dock for cottage shores. The dock comes standard with stylish side cladding. Basic-Susanna is a standard model that cannot be modified. The dock in the photo is located in Suodenniemi in Sastamala. Basic-Susanna dock on a privately owned shore in Asikkala. The dock is well-suited for swimming and leisure use as well as for mooring smaller boats. The Laituri Restaurant on the Ratino river in Tampere was built with Harbour Public docks. President63 dock in Hämeenlinna that serves as a dock for archipelago transport vessels but also as a swimming dock. President63 is an extremely stable and imposing dock. The dock in the photo has a steel ramp. Ajolanranta in Naantali's Rymättylä offers diverse boating services year-round. Ajolanranta's durable and stable Harbour docks meet even the most demanding boat owner's wishes. Large Harbour Demand dock in Parainen in Iniö equipped with bollards and a rescue equipment post. The dock also has large, covered dock fingers. Harbour docks are extremely stable and durable. Harbour dock elements can be attached to each other lengthwise or in a T or L shape. Harbour Standard marina in the Ii municipality, where boats are moored at dock fingers. The dock has a steel walking bridge, and the dock gate prevents unauthorised access. Low-Susanna has become a staple among cottage shore docks. The dock elements can be attached on each other lengthwise as well as in a T or L shape. The dock in the photo is located in Sweden. The installation in the photo has two Low-Susanna docks attached lengthwise as well as a third dock attached in a T shape. Railings enhance safety and comfort. The ramp rests on wheels on the dock's deck. The dock in the photo is located in Lieto. MyLife swimming facility in Janakkala built using Low-Susanna dock elements. The dock has a railing, benches, rescue equipment post, SL-140 swimming ladder and diving tower as accessories. Small children have their own separate swimming area. Low-Susanna docks are well-suited as swimming docks because of their low deck height. The dock elements can be attached to each other lengthwise as well as in a T or L shape. The swimming facility in the photo is in Somero. It also has a separate float built from a Low-Susanna dock. Swimming facility in Sweden built with Low-Susanna docks. Low-Susanna dock elements can be used for extremely functional solutions for swimming. Low-Susanna is an excellent dock for swimming beaches, as its deck height is close to the surface of the water. The dock elements can also be used to divide swimming areas. 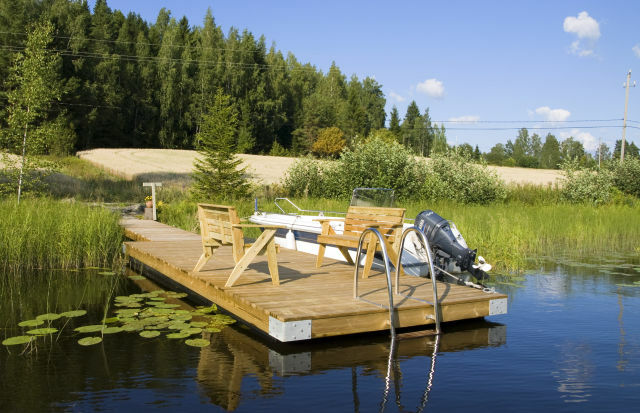 A swimming dock in Nokia, built from two Low-Susanna dock elements. Low-Susanna dock elements are large enough for a swimming dock and can be attached to each other lengthwise or in a T shape. The MyLife Elixer in Ylöjärvi is a structure for use by the visually impaired. There is an incline from the ramp to the dock's deck that facilitates access to the dock. Railings all along the way increase safety. The site has two identical docks with swimming lanes between them separated with ropes. SL-140 swimming ladders are double-framed and their slanted, wide wooden steps and high railing ensure that getting into and out of the water is easy and safe. Harbour docks are extremely stable and durable. Harbour dock elements can be attached to each other lengthwise or in a T or L shape. The Harbour dock in the photo has a steel ramp and is equipped with bumpers and bollards. The dock is located in Stockholm. President Standard dock at a privately owned shore in the Ii municipality. The dock is equipped with bumpers, electricity feed posts, TT bollards and an SL-140 swimming ladder. The walking bridge is attached to the dock with joints. High-Susanna dock elements can be attached to each other lengthwise or in a T or L shape. The High-Susanna dock in the photo is located in Sastamala. The dock has railings, bollards for mooring boats and an SL-140 swimming ladder. High-Susanna dock with two elements attached to form an L-shaped dock. The dock has attractive side cladding, railings as well as an SL-140 swimming ladder. The dock is located in Tampere. High-Susanna is a stable, attractive dock that is well-suited as a swimming dock and for mooring a boat. High-Susanna dock elements can be attached to each other lengthwise, as shown in the photo, or in a T or L shape. Susanna collection docks are large and stable with a high load-bearing capacity The dock in the photo is on a privately owned shore in Kuopio. Harbour collection marina in Murmansk. The Harbour collection is overwhelmingly superior in features and durability compared to solutions that use traditional concrete pontoons. Harbour docks are made of large elements attached to each other with flexible joints. Harbour collection marina in Källvik, Sweden. Harbour docks are made of large elements attached to each other with flexible joints. Optimal pontoon placement makes Harbour docks extremely stable. Harbour collection docks are used most often in building marinas, but they have also been used to build floating bridges and terraces as well as docks for archipelago transport vessels. Harbour collection docks are stable, have a high load-bearing capacity and are durable and imposing. The Harbour dock in the photo is located in Sweden. Harbour® collection docks are extremely stable and durable and are well-suited even for shallow water. The photo shows the Harbour collection marina in Mänttä. The dock is equipped with a special wheelchair access ramp. The guest marina dock in Vammala in Sastamala is from the Harbour collection. The dock is a specialty solution with a curved design. The Harbour dock's edge has a sturdy beam to which even large dock fingers can be attached. The high-quality Harbour dock collection is composed of large, durable dock elements. Large dock elements can be attached to each other lengthwise or in a T or L shape. The Harbour collection marina in the photo is in Vaasa, equipped with large dock fingers, bollards and electricity feed posts. Harbour dock elements are extremely sturdy in structure, with a steel cross frame to which pontoons and a strong wooden frame are attached. Harbour dock pontoons retain their load-bearing capacity and withstand impacts in freezing temperatures. The photo shows the Harbour collection marina in Rajasalmi in Oulu. Harbour+ collection docks are made of large elements with edge load-bearing capacity optimised by pontoon placement. If necessary the dock's deck can be made of sturdy planks, which also allow it to be used by light vehicle traffic. The photo shows the dock at the Virpiniemi coast guard station in Oulu. The dock is composed of two 12.5 metre long, 2.7 metre wide dock elements and an eight-metre long streel frame ramp. 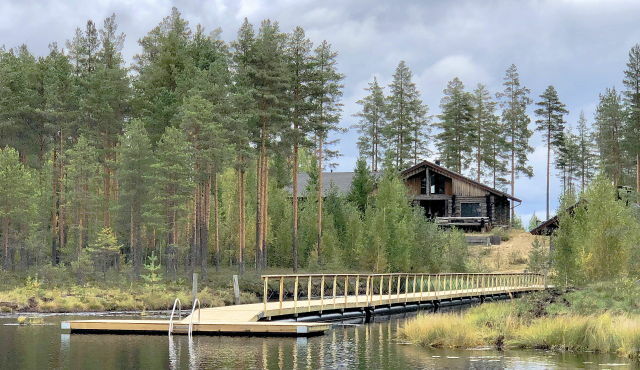 This floating pontoon bridge about 100 metres long connecting Kirkkosaari and Lahdentaus in Kuusamo was built with Harbour+ dock elements. Each element is 3.3 x 12.5 metres. The pedestrian bridge has a clearance of three metres. A pontoon bridge for pedestrians on an island in the Paimio River. The bridge is made of MyPort 2.4 x 12.54 metre dock elements and two 1.2 x 5.2 m ramps. Railings with aluminium posts as accessories increase safety. The dock is attached to a concrete abutment element on both sides of the shore. Floating terraces are always designed on a case-by-case basis. The Laituri Café's floating terrace in Vammala in Sastamala was built of dock elements from the Harbour collection that are 12.5 metres long. Railings enhance safety. This pontoon ferry in Pori was commissioned and made to measure. The ferry was built on PEHD pipe pontoons that are extremely durable with a long life cycle. The pontoons do not become water-soaked or lose their load-bearing capacity over the years. Pontoons are available in many specialty sizes, both in diameter and length. The Harbour Septi waste-water suction pump dock was built using dock elements from the Harbour collection. The Harbour Septi dock can be attached to other docks or anchored separately. 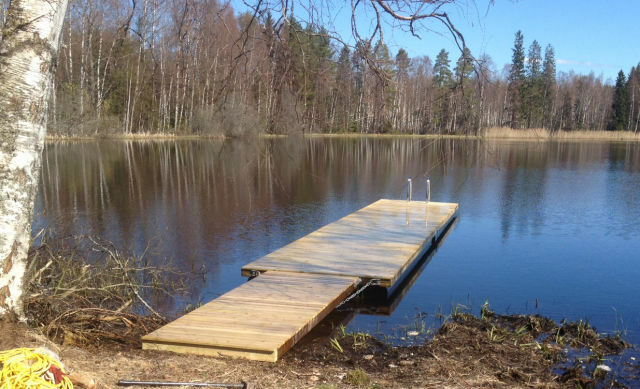 The dock in the photo is in Keuruu and has Cleanport Septic k200 septic equipment. The Low-Susanna dock's deck height is very low, near the surface of the water. Susanna pontoons are durable and do not lose their load-bearing capacity over the years. Harbour collection docks are made of large, high load-bearing dock elements. Harbour collection docks are normally left in place for the winter, but there are exceptions depending on shore conditions. Harbour collection dock elements are available in a number of different widths and load-bearing capacities. Standard deck height is about 60 cm, but can also be delivered with other deck heights. The photo shows the ship dock in Keuruu, which is 1.65 metres high. President collection docks are large and stable with a high load-bearing capacity. President dock elements can be attached to each other lengthwise or in a T or L shape.. Imposing and steadfast President docks bring elegance to the shoreline. President® docks are available in numerous different sizes and shapes. President® Silja is an attractive and durable leisure and swimming dock, which comes with a built-in bay where you can safely drive and moor your boat. President pontoons are durable and do not lose their load-bearing capacity over the years. President63 dock in Stockholm. President® 63 docks are made of large, heavy dock elements. The dock has a standard raised deck height. The dock's standard deck boards and vertical cladding are 50 mm, sturdy pressure-treated pine. The boards can also be manufactured from unimpregnated wood and treated with tinted wood oil with a colour of the customer's choosing, as shown in the photo. The dock in the photo is a President56 on the shore of the Serlachius Museum Gösta in Mänttä. President56 docks are large and extremely stable. The dock comes standard with stylish side cladding. The deck and side cladding of the dock in the photo were built of larch wood provided by the customer. Swimming dock in Ulvila, built from a High-Susanna Xtra dock. Big Susanna pontoons in a lengthwise shape guarantee large carrying capacity and the best imaginable stability for swimming docks. High-Susanna docks can be equipped with attractive side cladding as an accessory. Harbour Demand dock in Kitee. Harbour docks are imposing, stable and extremely durable. Harbour dock pontoons retain their load-bearing capacity and withstand impacts in freezing temperatures. The dock in the photo is equipped with dock fingers as well as mooring rings, a rescue equipment post, a dock gate and a safety step at the end of the dock. This bridge for light traffic in Naistenlahti in Tampere was built with heavy pontoons. The pontoon bridge is wheelchair-accessible. The bridge can also support the weight of small machinery. Uunisaarensalmi's pedestrian pontoon bridge located on the south side of Kaivopuisto in southern Helsinki. A durable, high load-bearing working ferry is helpful in many types of water construction and marine transport, including installation of anchor weights. The President Spa hot-tub dock and ramp can serve as a separate dock or be attached to other docks as an entirety. The covered hot-tub in the photo accommodates four to five people. The dock is in Sastamala. This dock restaurant in Stockholm (Norra Hammarbyhamnen) is a sandy beach, as tons of sand were delivered and spread on its deck. This large Harbour dock element was equipped with deep waste-collection containers. Harbour collection docks are extremely durable and stable. Floating platform for a sauna built with a President dock. Pontoons are durable and do not lose their load-bearing capacity over the years. Service dock with a steel deck in Tampere. The Peurunka spa hotel's Low-Susanna swimming dock is wheelchair-accessible. The dock also has a separate swimming level that facilitates getting into the water. Large, durable and stable President63 archipelago transport vessel dock in Loviisa. President63 dock at a privately owned shore in Sastamala. President® 63 collection docks are made of large, heavy dock elements that come standard with a raised deck. The deck and cladding of the dock in the photo are made of unimpregnated wood and treated with a tinted wood oil. The dock in the photo has railings, bollards and an SL-140 swimming ladder as accessories. President Standard dock at Kuopio's exhibition location. President docks are composed of large floating elements and a walking bridge. President pontoons ensure high load-bearing capacity and the best possible stability, from swimming docks to docks for large boats. Large President dock at a privately owned shore in Perniö. President docks are extremely durable and stable. The dock in the photo has Toppi Fender bumpers, a swimming ladder and bollards as accessories. Harbour collection docks are large and stable with a high load-bearing capacity. Harbour pontoons ensure the best possible stability for swimming docks as well as boat docks. Harbour dock elements can be attached to each other lengthwise or in a T or L shape. The dock in the photo is in Sastamala. President Silja is a durable, stable and attractive leisure and swimming dock where a boat can also be moored. President Silja docks can be equipped in a wide variety of ways. The dock in the photo is located in Sweden. President Silja is a durable, stable and attractive leisure and swimming dock where a boat can also be moored. President Silja docks can be equipped in a wide variety of ways. The dock is the photo has a railing and swimming ladder as accessories. The dock is located in Virrat. Basic-Susanna dock is composed of floating dock element and a walking bridge. Basic-Susanna is a standard model dock that cannot be modified. Large lengthwise pontoons ensure high load-bearing capacity as well as the best possible stability. Basic-Susanna is very well suited as a swimming or leisure dock. The dock in the photo is located in Äetsä in Sastamala. Basic-Susanna dock is a standard model dock that cannot be modified. The walking bridge is attached to the dock with joints. Although the dock is a standard shape, it can be equipped in different ways. The dock in the photo has a swimming ladder as an accessory. Little-Susanna docks are well-suited as swimming and leisure docks as well as for canoe mooring because of their low deck height. The dock in the photo, built parallel to the shore, is located on a privately owned shore in Loimaa. The location is sheltered, but narrow and flowing. Little-Susanna dock at a privately owned shore in Nokia, with two dock elements attached together lengthwise. The dock in the photo has a swimming ladder as an accessory. Little-Susanna docks are well-suited as swimming docks as well as for mooring canoes. Little-Susanna is fairly small, but its lengthwise pontoons make it a stable dock. Little-Susanna docks are well-suited as swimming and leisure docks as well as for mooring canoes. The dock in the photo is located on a private shore in Kuopio. Little-Susanna is a small dock for holiday home and cottage shores. Little-Susanna also has sufficient size and load-bearing capacity to keep it stable, so unsteadiness is not bothersome. The dock in the photo is located on a private shore in Sastamala. High-Susanna Xtra is an imposingly large and attractive dock that can accommodate a larger group of people. High-Susanna docks can be equipped with attractive side cladding as an accessory. Large lengthwise Susanna pontoons ensure high load-bearing capacity and the best possible stability for swimming docks as well as boat docks. The Piikkeensalmi boat and ship dock on the western shore of Pyhäjärvi in Kitee's Kesälahti is from the Harbour Demand collection. Harbour docks are composed of large elements that are structurally extremely stable. The elements have a steel cross frame to which pontoons and a sturdy wood frame are attached. The service and fuelling dock at Maljalahti harbour near the centre of Kuopio is from the Harbour Demand collection. The dock is 25 metres long and extremely stable, with a steel-frame ramp. Guest marina in Kristiinankaupunki, where boats are moored from the side to buoys. The dock is equipped with bumpers. The dock is from the Harbour+ collection. Marina in Tvärminne in Hanko, which was built with Harbour+ collection docks. Harbour collection docks are used most often in building marinas, but they have also been used to build floating bridges and terraces as well as docks for archipelago transport vessels. Harbour docks are made of large elements attached to each other with flexible joints. Harbour Breakwater is a breakwater dock with a design based on placement of pontoons as well as underwater pontoons filled with water. The photo shows the Pyhäjärven Järvipelastajat marine rescue organisation's dock in Säkylä. Japi is a light and handy dock for sheltered shores. The Japi dock package is a standard model that cannot be modified. The total length of the dock including the ramp is seven metres. The dock in the photo has accessories. The standard Japi dock is delivered in component parts, with the parts packed on a forkligt pallette so the package is easy to transport on a trailer. The package includes clear assembly instructions with diagrams. The dock is also available pre-assembled. The dock in the photo has been an exhibition location at LaituriMaailma in Sastamala. Myllysaari swimming facility in Lappeenranta. Harbour dock elements were used to mark out a swimming area by the changing rooms. The railing runs along the entire exterior side of the docks. The docks are equipped with SL-140 swimming ladders. Harbour Standard dock on the Kiesilä shore in Suomenniemi. Harbour docks are composed of large elements which comes standard with stylish side cladding. Harbour docks are imposing, stable and extremely durable. The dock in the photo has buoys, mooring rings, an SL-140 swimming ladder and a rescue equipment post as accessories. The municipality of Larsmo, i.e. Luoto's marina was built using Harbour Standard 2.4 x 10 metre dock elements. Harbour collection docks are made of large dock elements with side cladding that reaches almost to the waterline. Harbour docks are also suitable for low water. Low-Susanna is a idyllic swimming dock, since its deck is only 25 cm from the surface of the water. Large lengthwise pontoons ensure high load-bearing capacity as well as the best possible stability. The dock in the photo is located in Kokkola. The Niemi marina in Lahti has a seaplane dock that was constructed using MyPort Xtra dock elements. Side docks were attached with joints directly to the main dock's side plank for mooring the seaplanes. The dock was installed parallel to the shore and anchored to the bottom with concrete weights and chains. Harbour Standard dock in Vaasa. . Harbour collection docks are used most often in building marinas, but they have also been used to build floating bridges and terraces as well as docks for archipelago transport vessels. Harbour collection docks are extremely stable due to their size and optimal pontoon placement. Large dock elements can be attached to each other lengthwise or in a T or L shape. The Low-Susanna dock's deck height is very low, near the surface of the water. Susanna pontoons are durable and do not lose their load-bearing capacity over the years. The dock in the photo is used by a canoeing club. Swimming facility in Savonranta in Savonlinna. Low-Susanna docks can be used to build attractive swimming facilities. Large dock elements can be attached to each other lengthwise or in a T or L shape. The dock's deck is only about 25 cm from the surface of the water. Swimming facility in Sulkava was built with Low-Susanna docks. Low-Susanna dock elements are large and durable, and due to their low deck height are well-suited as swimming docks at public beaches. The dock in the photo has a rescue equipment post and swimming ladder as accessories. President Demand cottage dock in Hattula. President docks can be equipped with different types of walking bridges and railings. The dock comes standard with stylish side cladding. The dock elements can be attached on each other lengthwise as well as in a T or L shape. Harbour634 dock in Kokkola. Harbour63 collection docks are built with Harbour dock pontoons with a diameter of 630 mm. The docks are large with a high load-bearing capacity and can be built with different deck heights. The marina in St. Petersburg has three Harbour docks side by side. Harbour collection docks are used most often in building marinas, but they have also been used to build floating bridges and terraces as well as docks for archipelago transport vessels. President dock in Korpilahti with an attractive lattice railing on both the dock and the ramp. President docks can be equipped with different types of walking bridges and railings. The dock comes standard with stylish side cladding. The City of Jyväskylä marina was built with Harbour collection docks. Harbour collection docks are made of large dock elements with side cladding that reaches almost to the waterline. Harbour pontoons are extremely durable and have good impact resistance in cold conditions. Harbour collection marina in Keitele. Harbour collection docks are used most often in building marinas, but they have also been used to build floating bridges and terraces as well as docks for archipelago transport vessels. Harbour collection docks are extremely stable due to their size and optimal pontoon placement. This MyLife swimming facility of Suolahti was built with Low-Susanna docks. Low-Susanna dock elements are large, durable, and well-suited for use as swimming docks. The Suolahti swimming facility also has a diving tower. Kuusankoskella sijaitseva raskasponttonilaituri. Raskasponttonilaiturit toimitetaan vakiona betonipintaisena ja reunapiirulla varustettuna, mutta kansi ja kyljet voidaan myös verhoilla painekyllästetyllä puulla. Yksikin raskasponttoni toimii itsenäisenä laiturina, mutta niitä voidaan liittää toisiinsa. Kuvan laituri on erikoiskorkea kansikorkeus. Archipelago transport vessel docks in Jämsä are Harbour Demand docks. Harbour dock elements are normally available in a number of different widths and load-bearing capacities. Low-Susanna model MyLife swimming facility in Kurikka. Low-Susanna docks can be used for extremely functional solutions for swimming. Large dock elements are stable and durable, and Low-Susanna's deck height is close to surface of the water. The dock elements can be attached to each other lengthwise as well as in a T or L shape. Harbour collection boat dock in Tornio. Harbour collection docks are made of large dock elements with side cladding that reaches almost to the waterline. Large dock elements can be attached to each other lengthwise or in a T or L shape. MyPort cottage dock in Kangasala. MyPort collection docks were originally designed for marinas, but experience has shown that MyPort docks are also excellent for swimming and leisure use. MyPort collection docks are suitable for use as swimming and boat docks for both holiday home and cottage shores as well as for marinas. MyPort dock elements can be attached to each other, and dock fingers can also be attached to them. The dock in the photo has been an exhibition dock at LaituriMaailma in Sastamala. Harbour marina in Tampere. The high-quality Harbour dock collection is composed of large, durable dock elements. Harbour docks can be equipped in different ways, and the sturdy edge beam allows even large dock fingers to be attached to the dock. Harbour dock in Mustasaari. Harbour collection docks are made of large dock elements which can be attached to each other lengthwise or in a T or L shape. Harbour dock elements are extremely sturdy in structure, with a steel cross frame to which pontoons and a strong wooden frame are attached. Joensuussa sijaitseva betoniponttonilaitureilla rakennettu venesatama. Betoniponttonilaitureita on saatavilla useita eri kokoja ja malleja. Laitureiden runko ja kansi ovat puuta. Harbour Standard boat dock in Pyhäjoki, with dock fingers installed on only one side. The dock also has light and electricity feed poles. Harbour dock elements are extremely sturdy in structure, with a steel cross frame to which pontoons and a strong wooden frame are attached. The Harbour dock at Haikko Harbour in the Hailuoto municipality is 2.4 metres wide. Harbour docks can be equipped in many different ways, and even large dock fingers can be attached to them. The dock fingers in the photo are eight metres long. The Maljalahti marina in Kuopio is from the Harbour collection. Harbour collection docks are made of large dock elements with side cladding that reaches almost to the waterline. Large dock elements can be attached to each other lengthwise or in a T or L shape. Porin Reposaaressa sijaitseva raskasponttonilaituri. Betonirakenteiset raskasponttonilaiturit ovat kestäviä ja vakaita kelluvia laitureita. Raskasponttoneilla saavutetaan suuri kantavuus, joten ne soveltuvat myös vaativimpin paikkoihin. Yksikin laiturielementti toimii itsenäisenä laiturina, mutta elementtejä voidaan liittää toisiinsa. President Standard dock at a privately owned shore in Riste in Kokemäki. President collection docks are large and stable with a high load-bearing capacity. The dock in the photo has an attractive railing on both the walking bridge and the dock. The dock also has a bench and a swimming ladder. President dock at a privately owned shore in Rauma.Dock elements can be attached to each other. President docks can be equipped in a wide variety of ways. Harbour Standard marina at the fishing harbour in Säkylä.Harbour dock elements are extremely sturdy in structure, with a steel cross frame to which pontoons and a strong wooden frame are attached. Harbour dock pontoons retain their load-bearing capacity and withstand impacts in freezing temperatures. The Vuosaari marina in Helsinki was constructed using Harbour Standard docks. Harbour dock elements are extremely sturdy in structure, with a steel cross frame to which pontoons and a strong wooden frame are attached. Harbour marina in Inkoo. The Harbour collection is overwhelmingly superior in features and durability compared to solutions that use traditional concrete pontoons. Harbour docks can be equipped in many different ways, and even large dock fingers can be attached to them. Helsingissä, yksityishenkilön rannassa oleva betoniponttonilaituri. Betoniponttonilaiturit ovat kookkaita ja painavia laitureita. Kantavuutta on reilusti, joten ne kestävät vaativatkin olosuhteet. Valmiita elementtejä voidaan liittää toisiinsa joko peräkkäin tai T-malliseksi laituriksi. High-Susanna is a large, extremely stable and durable dock. High-Susanna docks can be equipped with attractive side cladding as an accessory.The dock in the photo is in Inkoo. High-Susanna dock in Urjala.High-Susanna is a stable, attractive dock that is well-suited as a swimming dock and for mooring a boat. The dock in the photo has accessories including side cladding, a swimming ladder and bumpers. Nauvo's MyLife swimming facility was built from MyPort docks. MyPort docks are durable and stable. MyPort dock elements can be attached to each other lengthwise as well as in a T or L shape. MyLife swimming facilities can be equipped in diverse ways. MyLife swimming facility in Kuusjoki in Salo, which has two Low-Susanna docks and a walking bridge. The dock has three SL-140 swimming ladders, dock benches as well as a railing along the ramp of one of the docks. MyLife swimming facility in Öland, Sweden was built with Low-Susanna docks. Low-Susanna dock elements can be attached to each other. Low-Susanna docks are well-suited as swimming docks because of their low deck height.